I really like him. My only problem with him, more of a concern actually. If he’s a hero he must be on dress parade because he doesn’t look like he’s ever seen any action haha. A fantastic paint job as expected from you sir but I’ve always like a little damage. Unless of course he is so good he has remained completely untouchable or has he just run away and told every the opposite? Great work man!! Haha – yeah, he is squeaky clean in his disco armour… I like to think the cleanliness is ‘because magic’! Thanks for the kind words dude, any thoughts on who to tackle next? Darkoath Chieftain. 100%. I like the model but haven’t seen him painted well, or should I say, to my liking yet. You’re the man to do it. No pressure haha. Ahhh… there will be no clean paint job for that guy! 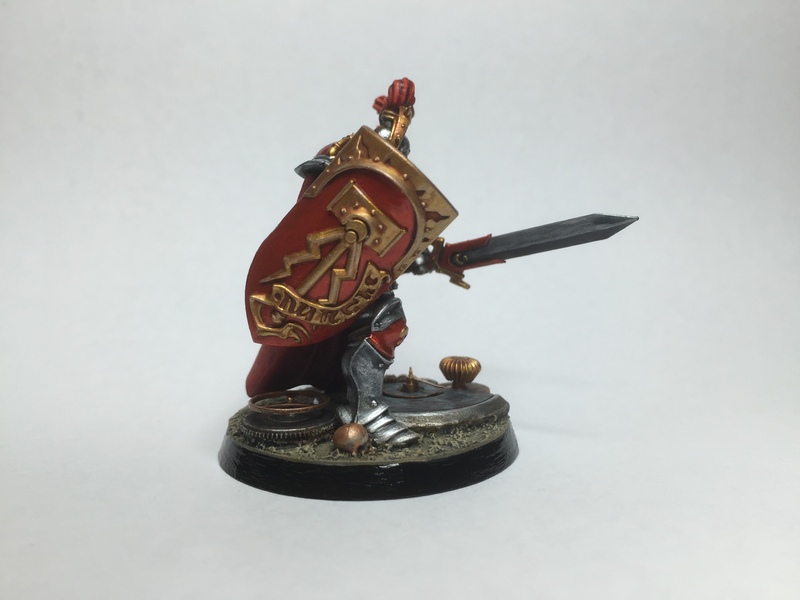 Lovely colour-scheme on the Stormcast and the base looks great, well worth the effort I’d say. As for who to tackle next, are you counting the Gaunt Summoner as a hero? Otherwise what about the dwarf? I’ll admit he’s never grabbed me as much as some of the other characters but if you’re looking to keep practicing ‘clean’ looking models then he’d be a natural follow-up to the Stormcast. Reckon there’s some really interesting effects could be created using the runes on his back as well. I must admit, I am pretty chuffed with the scheme myself – it certainly pops! Nicely done but I also think you could have made it work in your usual “grungy” style. Sometimes it’s nice to try something new though! Hey, thanks for the kind workds Krauty, glad you like him mate :-) Honestly, I’m not sure what the point of the gemstone paints is – I can only guess it’s an easy way to paint gems for those that don’t know how to do it the ‘normal’ way… It is basically a coloured gloss, so I’m just having a play really! I may end up doing a test card and see what the different colours look like over different metalics and primaries… yeah, that sounds like a good idea! 1) 3am (Stormcast) Eternal is a great name for a post. 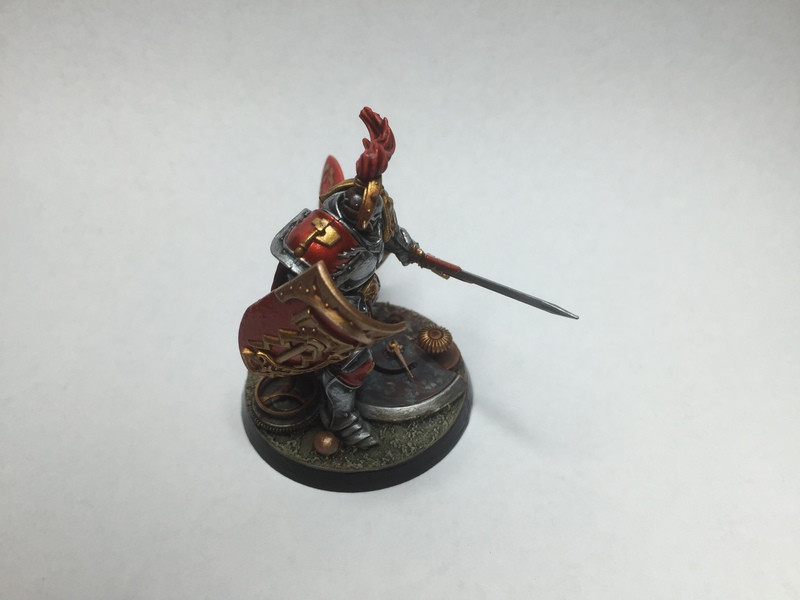 3) as Krautscientist mentioned, that is one of the most appealing Stormcast miniatures available. Your colour scheme is one of the most appealing that I have seen on that figure too. Fantastic work. 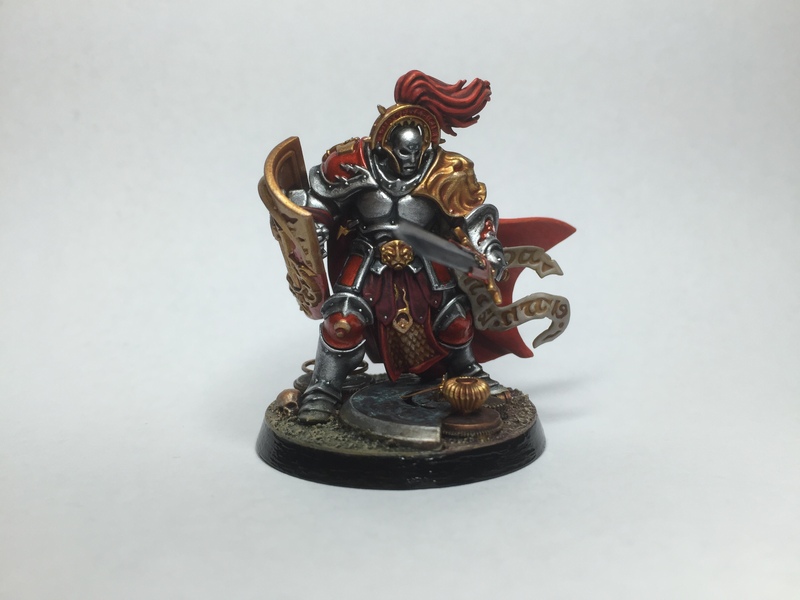 I also plan to primarily go with silver on my Knight Questor (I have started a Silver Tower painting project myself, but you know that). Entirely gold armour is a step to far for me. The silver as you used it gives a (slightly) more believable look to the figure, being reminiscent of a classic knight, rather than say, Ali G for example. 4) I would like to see the dwarf painted next, although Im really probably more interested to see how you tackle the various adversaries. Thanks for the kind words mate, and yeah, I felt that the full C3PO would be a step too far… I’m not too keen on the matt colour examples I’ve seen either, but I’m pleased with the silver. Glad you approve mate, and looking forward to seeing yours! Great work here – the red gemstone paint has given a nice “candy enamel” look to those red panels that I’ll absolutely rip off down the line on something. Yours is easily one of the top silver schemes I’ve seen and I think that’s because of the red and gold accents. I’m not too taken with the coloured ones, either. A bit too much Space Marine in the SigMarines, I think – though I do admit I like the gold ones. Call it Bronze overlay and it’s all good (though I think the official explanation is closer to “gold because magic” or “we painted them gold because they look good – don’t think too much!”. It looks beautiful! 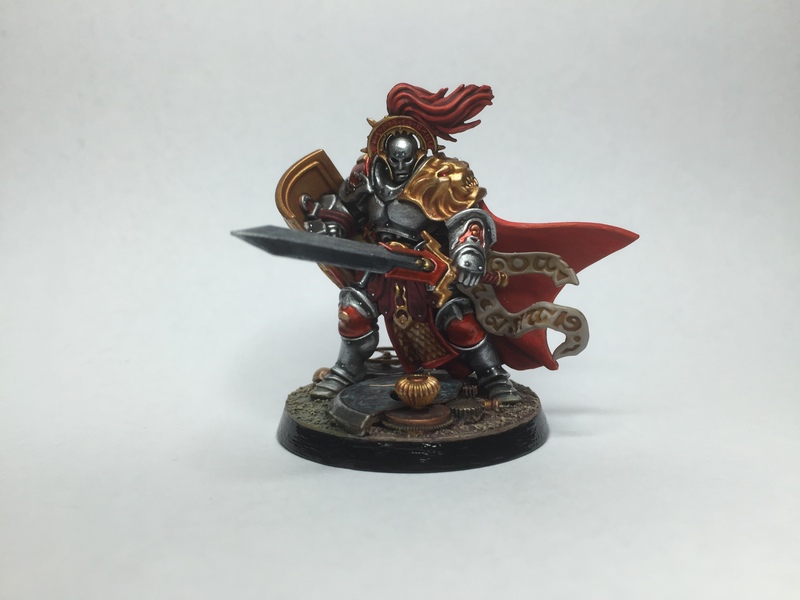 Can you run us through the paints you used on various parts quickly, or a how to? I’m about to start my first Stormcast and this is a great colour scheme inspiration. Thanks man, and wow, now I need to try and remember! 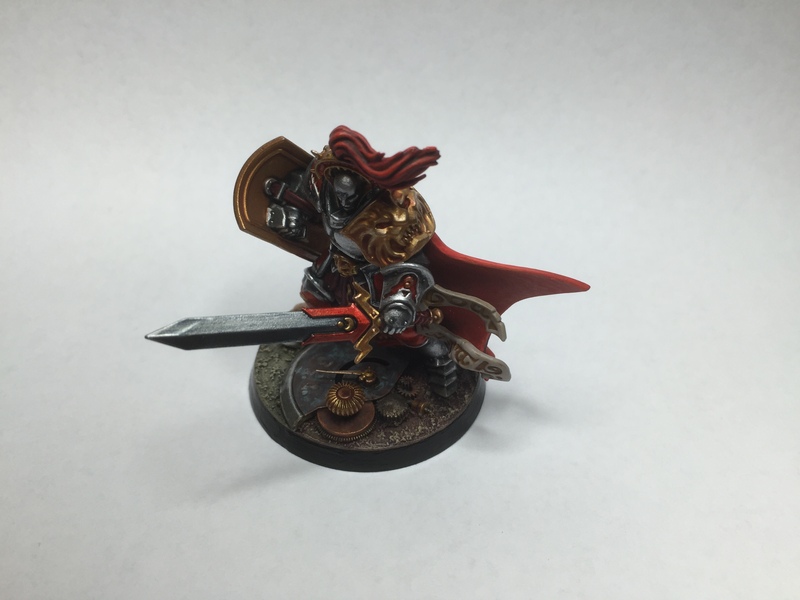 I think that the silver would be Iron Breaker highlighted with storm-host silver, probably with a light nuln oil wash and an edge highlight of runefang. Gold was definitely Retributor Armour, washed with flesh-shade & highlight with Liberator Gold. 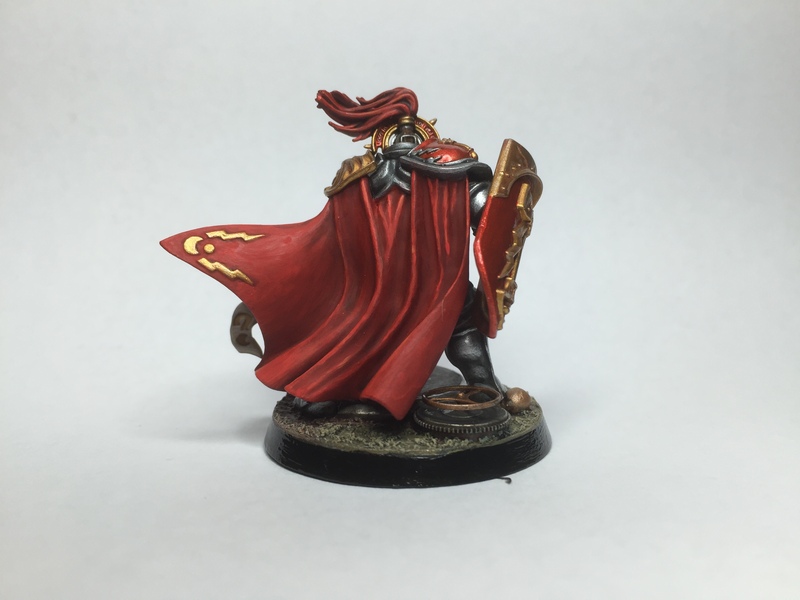 The red enameled areas are spiritstone red gem paint over a gold base – be sure to highlight the gold up properly before the gem paint goes on, and apply it thinly (it’s a gloopy paint, so several thin coats needed). The red cloth & leather will just be mephiston red, shaded with crimson wash and highlighted up through evilsunz scarlet to wildrider red, and then a couple of red glazes to help blend it all together. Hope that helps mate – good luck! !